“This horse-back breaker, this hill of flesh... that swollen parcel of dropsies... How long is it, Jack, since thou hast seen thy own knee?” If Shakespeare's rotund rogue, Sir John Falstaff, wasn't the role Orson Welles was born to play, it was certainly one he had grown into by the time he realized a life-long dream with the release of “Chimes at Midnight” (1966). Welles's affinity for the character extended far beyond a mutual appetite for an eight-course feast and a tankard of sack (the medieval term for Paul Masson chablis, I believe). From the time he was a teenager at the prestigious Todd School, Welles dreamed of making Shakespeare's corpulent comic relief the protagonist of his own play, perhaps sensing a kindred spirit in the bloviating buffoon. Welles was no buffoon, but he gleefully spun lies for a living, relying on his acrobatic story-telling skills off-screen as well as on-screen after early commercial success gave way to a peripatetic existence in which he constantly struggled to scrape up the necessary funds to pursue his various projects. The Spanish producers who finally greenlit “Chimes At Midnight” may have actually been paying primarily for a promised adaptation of “Treasure Island,” but Welles was never one to worry much about technicalities. In the end, it's all true. Considering how long Welles developed the project in various forms – he staged a version with the Mercury Theatre in the '30s and then another play in 1960 in Dublin and Belfast – it's no surprise that the film would turn out to be a deeply personal one for the great director. However, it is a testament to his unique gifts that he could stitch together multiple Shakespeare plays – a few Henrys and a Richard primarily – and, using only the Bard's words, craft such an intimately autobiographical story. Welles merges so completely with Falstaff that it's almost impossible not to view both of them as equally present in each scene. Welles envisioned Shakespeare's signature scoundrel as a mischievous rogue with a heart as big as his waist: he lies only to please his listeners, loves everyone he swindles, and only wants everyone to enjoy the pleasures of daily life as vigorously as he does. Hollywood's legendary boy wonder had been playing the role of the charismatic bon vivant in interviews for years, thoroughly charming everyone fortunate enough to share his orbit. 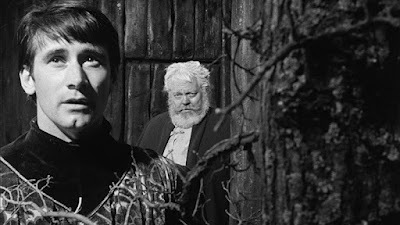 Cutting and pasting from multiple plays could have produced a shapeless, indulgent mess, but Welles realized the spine of his story was the close relationship, a virtual love story, between the aging Falstaff and the young, wayward Prince Hal (Keith Baxter). Falstaff serves as the unreliable but loving mentor whose morally lax tutelage prepares the lazy prince, by roundabout routes, to become the worthy successor to Henry IV (an outrageously great Sir John Gielgud). 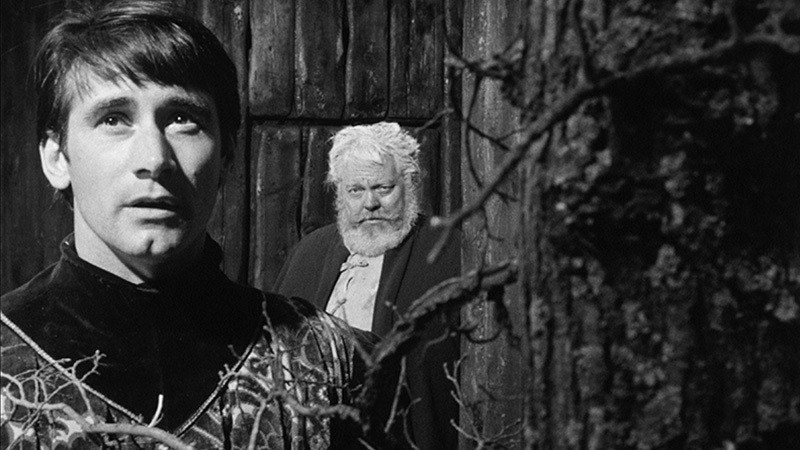 Their carefree adventures forge a genuinely funny and intimate bond between the two, Falstaff being the emotionally available father figure to Hal that the distant king can never be, and sets up one of the finest scenes in any Welles and/or Shakespeare play, the prince's renunciation of his disreputable old friend upon being crowned the new king. 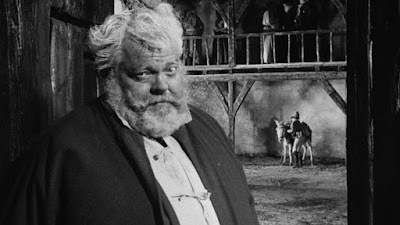 Savor Welles's quiet reaction, processing his mule-kick-to-the-face public humiliation alongside the burgeoning pride of witnessing his young charge now all grown up – a master class in multi-layered acting. Shooting in high-contrast black-and-white, cinematographer Edmond Richard makes magnificent use of the massive interior castle spaces, with beams of dusty light from windows high above stabbing through vast, gloomy chambers, both low and high angle shots constantly highlighting the vast scale. Watch those buttresses fly! Exterior shots in barren woods are studies in stark, efficient beauty. It's all so elegantly staged, it's hard to believe the film was shot on such a modest budget, a budget that somehow found room for the likes of Jeanne Moreau (who pronounces "whoreson" to rhyme with "Orson") and Margaret Rutherford along with Gielgud. A brilliant lead performance, a perfect balance of comedy and tragedy, impressive settings, and gorgeous black-and-white cinematography only form half the story, the rest being the result of some of the most innovative editing cinema has ever been blessed with. Welles spins his characters in constant motion, and jumps aggressively from close-ups to very distant shots, giant jowly faces turning into tiny figures in the distant background, enabling him to transform even cramped sets into dynamic locations and simple conversations into kinetic spectacles. The grandest spectacle of all, however, is the unparalleled Battle of Shrewsbury, in which Welles employs the magic of his Moviola to send a modest number of extras careening into each other with elemental fury, clipping out frames to speed up the frenzied action. And in the most inspired touch of all, he intermittently cuts from the heart of the fray to the indelible image of Falstaff in full plate armor, a pot-belly stove with tiny arms and legs trying to wobble away from any real danger while staying close enough to take credit for the accomplishments of others. For all of its considerable technical accomplishments, the heart and soul of “Chimes At Midnight” is Welles's endearing, heartfelt performance, his Falstaff always with a twinkle in the eye, laughing and roaring his way to an industrial-sized casket – alas, Merrie Olde England is No Country For Fat Men. It's the finest role of his career and perhaps of anyone's career. I'm inclined to think that the two greatest characters in film history (at least the part of it with which I'm familiar) are Delphine Seyrig's Jeanne Dielman and Welles's Falstaff. In a medium of light and shadow, structured around absences, they're the most tangible presences ever produced. Pardon me if I cry a little. It's been a rough year, and I want to appreciate one of its little miracles. Like most people I had only previously seen “Chimes At Midnight” under miserable conditions; for me, a badly worn VHS with a faded image and warbly, out-of-synch sound. I sometimes wondered if “Chimes” was really as great as I remembered, or if I had filled in the blanks in a spotty version with the masterpiece of my imagination. With this high-def restoration from Criterion, sourced from a 2009 restoration at the Filmoteca Espanola, I now know that I was actually underrating it. Fans would have settled for even a modest improvement; instead this half-lost film finds itself looking and sounding like brand new. OK, maybe not quite, but far closer than most of us ever dared to dream of. Image detail is sharp throughout with minimal evidence of excessive boosting in the restoration process. You get to appreciate every nook and cranny of Welles's jowly face and the black-and-white contrast is also sharp throughout. I'm sure someone somewhere is arguing about how “authentic” the restoration is – all I can say is it looks fabulous. The soundtrack has been the biggest problem in previously available versions of the film, many featuring a reel or two that were out of-sync. The linear PCM mono mix from Criterion appears to correct any previous problems, with no audible distortion in either dialogue, effects, or the music by Angelo Francesco Lavagnino. Welles recorded all of the dialogue in post-production, and he never cared too much about matching lip movements with sound, but it's hardly a flaw here – who would want that magnificent rumbling baritone of Welles to be anything but its most resonant? Optional English subtitles support the English audio. Criterion has loaded up a hefty helping of new extras. The film is accompanied by a commentary track by James Naremore, one of my favorite film writers. Naremore, author of “The Magic World of Orson Welles,” provides a great deal of detail regarding Welles's production methods, especially how he culled multiple Shakespeare plays into a single text. The disc includes several interviews. First up is actor Keith Baxter (29 min.) who discusses how an early encounter with Welles shaped his career. He and Welles became very close during the making of the film, and Baxter remained friends with other members of the Welles family after Orson's death. Second is an interview with the director's daughter, Beatrice Welles (14 min.) who played a page in “Chimes” when she was about eight – she notes wryly that her father never paid her for the role. Simon Callow (31 min. ), author of multiple books on Welles, traces the origins of the Falstaff project throughout Welles's life, and emphasizes just how happy the director was while making the film, something not always true as he was forced to abandon so many projects later in his career. He also talks about the film's troubled theatrical release and its shabby treatment over the decades. The final new interview is with author Joseph McBride (26 min.) who can be forgiven for bragging about an early meeting with Welles in which the great man himself described McBride as his favorite film critic, the only one who really understood what he was doing. Sure, it's possible Welles said that to everyone, but I'd still be living on that compliment too. The disc also includes a Sep 11, 1965 appearance by Welles on the Merv Griffin show (11 min.) Welles wasn't on set with Griffin, but is featured in a short filmed interview conducted with Welles sitting at his moviola, still editing “Chimes.” Frustratingly, the interviewer harps on old, well-worn topics like the “War of the World” broadcast and the early success of “Citizen Kane.” But Welles is so magnetic, it's still riveting viewing. Finally, we get a Theatrical Trailer. The slim fold-out booklet features an essay by film scholar Michael Anderegg. Do I have to pick a favorite Welles film? No? 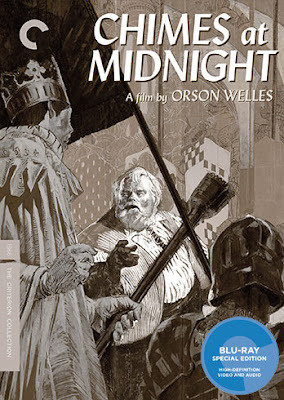 I'm going to pick anyway, and my choices is “Chimes at Midnight.” And if it's the best of Orson Welles, then, basic logic would tell you it's one of the best films ever made. This definitive Criterion release may well have been the biggest film event of 2016.